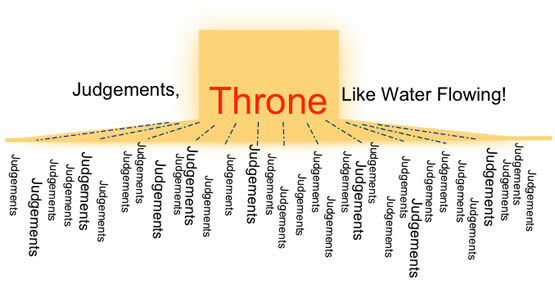 Judgement Meetings - Crowning the Lord KING! For a little back ground, when the Lord first started having us meet in a barn, in that barn we found a 4X8 sheet of plywood with a picture of Jesus wearing a crown painted on it. The Lord began teaching us about Him being a King and that we didn’t know how to treat Him as a King. We placed this picture of Jesus in a place were people would see Him when they came into the building. We had a variety of different denominations among us so I understood that the church in general doesn’t know how to treat Jesus as their King. I certainly didn’t know. Through the years the Lord taught us to do what He calls “Judgement Meetings,” where we present questions to the Lord in an envelope with people not knowing what is in the envelope. Hearing His answers without knowing the questions keeps our souls and spirits from hindering a clear recording of His answers. Person A - "Prepare; anointment; My Prophet; worthy; appointment"
Person B - Scene, he was before the Throne & saw Judgements flowing down, solid like water flowing down, so wide in front of the Throne that it was beyond what he could see. "clean slate"
Person C - Scene, Saw a right hand dusting something / somewhere. Person D - The Lord had her hold her hands up so nothing would leak over. "receive; My cup; overflows; for you"
I point out that we previously had Judgement Meetings after almost every regular meeting. I didn’t know it, but the Lord was about to let me see a most spectacular scene to prove His Point about making Him King. Three days after asking the Lord the above question we had a Judgement Meeting. I was suddenly in a Throne type Room, not for a flash of time, but for some time. I got to look around a little, all for the Lord’s purpose. To give you some prospective, I was up higher and the member’s (in front of me) heads were about belt high on me. The part of the floor I saw was covered with a rich, deep red carpet, what I call covenant red. It should be noted that this room was wider than the pillars and I don’t know if the red carpet went out to the pillars or not. All of us who were at this meeting were physically in our regular places for Judgement Meetings; only in this scene members were around twenty five to thirty feet apart, in a line as we usually are (as pictured). The pillars on the outer edge of what I saw looked like glass, meaning pure gold. This was a large room, much longer than it was wide. The only physical thing of this world I saw was the Island in front of me where we present the questions to the Lord. I didn’t see myself, but the other people in this meeting seemed to be wearing some kind of robe. I’m not really sure of the color. In front of us was a rise, a platform, about four to six feet or higher and was also covered with rich, deep red carpet. This is where Jesus stood, not sitting on a Throne. If there was a throne I could not see it behind Him. There seemed to be a lot of area (not pictured) behind Jesus. Jesus was wearing a very white king's robe with possibly white fur or something different as a wide trim. I wonder if the robe had some pure gold on it, or in it, because of how it looked. HE was wearing a most spectacular crown of glass, meaning it was pure gold, with diamonds on it. He had a shepherd's staff in His right hand. He may have had ahold of even more. I had already seen Jesus in heaven and had seen Him crying more than once over what He has to do in End Times, but this is the only time I have seen Him wearing a crown. I cannot say enough about His splendor or that of His crown! The Lord was showing this so that our group would see how important Judgement Meetings are. I didn't get emotional looking at the Lord in all that splendor but it was inspiring, fascinating and totally beyond awesome. I did tend to get emotional when I looked at the backs of this group standing as individuals before the Lord this way. My Lord! This was a Judgement Meeting, what an honor for us to be in it! Jesus’ crown was taller and wider than any I have ever seen. The ribs across the top were about an inch wide and there were several of them, each with diamonds every four or more inches apart. The crown looked light. The head band was not wide and I don’t think it had any points on it. It was an immaculate crown. This scene was totally awesome, beyond words, seeing Jesus crowned King on Earth. I have realized that Jesus was crowned King in heaven by actions, but He has never been crowned King on earth by men’s actions until now. We as a people can call and declare Him King of our lives, but those are just words. One time the Lord said, “I don’t want your lip service!” He was wanting our acts along with what we speak. So for us to crown Jesus King we must make Him King of our ministries and our lives by going to Him for every situation, for direction and answers. The Bride does this! It is the Lord’s ministry in the earth, so how else can we know details? That is why the Lord has given us protocol for Judgement Meetings with Him as King. 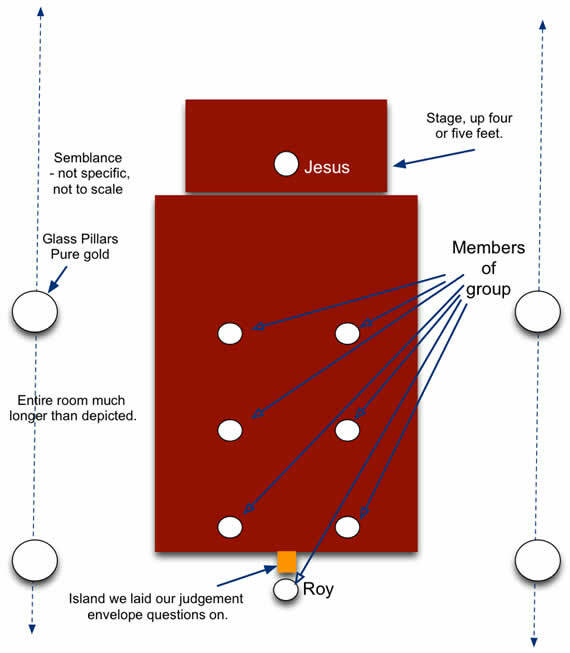 Doing Protocols before a King is not a religion, but simply “honoring a King.” Doing Judgement Meetings is not a hard thing and the Lord revealed they can be done even around a picnic table in a park. So we see they can be done anywhere; we only need to know the basics and the protocols. Did you know that in the Temple there was a protocol for the priests to follow when asking questions of the Lord? I don’t know all of the protocol, but there were stones of the twelve tribes on the high priest’s garment. Also, there were two items (Urim and Thummim) that somehow designated a "yes" or "no" when the priest asked a question. From this we understand that the Lord was controlling things then. We need to be asking many more questions of the Lord now, so we can stay more accurately on the Lord’s path for us. For a long period of time the Lord has been telling us, “ASK, ASK, ASK” for this very reason. We cannot assume what the Lord wants; we must ASK! It is imperative that ministries who want to let the Lord be the head have Judgement Meetings, as well as Golden Meetings. The reason why is to hear if we heard correctly about anything, helping keep Python and our own spirits out. Here is one simple example of why Judgement Questions are needed: Years ago we started having books translated overseas. People would ask if they could translate and we sought the Lord while making a decision, instead of before making a decision. We had some mishaps of having some books translated to find out the translator couldn’t translate correctly for whatever reason. So we learned to ask the Lord through envelope questions, as we came to understand that the Lord is the only One who knows if a person can translate correctly. So here is the general pattern we use now for getting books translated through using Judgement questions. 1. We ask the Lord if the person can translate correctly? 2. If the answer is affirmative we ask the Lord if we are to use the person for this purpose? 3. If that answer is affirmative we let the person translate. 4. Once the translation is done we ask the Lord if the translation is correct. 5. If the Lord reveals a, “yes,” we continue on using the translation as the Lord directs.